JayTheBanker's Blog: On the JUMBO-TRON! I am still alive... Not that there was any real question about it... It's just been awhile since I've posted. We were at a concert not that long ago and about the time I looked up.. "BAM!" 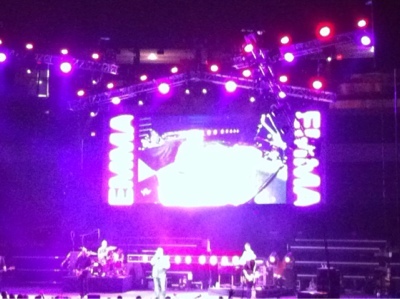 There was EMMA's name on the jumbo tron screen. Wha?? Ok, actually it went on to scroll "EMMANUEL".. and it was a piece of the lyrics of a Mercy Me song.. I have always found it interesting how God mingles and weaves things into my life.. "God is with us"
It was a simple concert.. Worshipping the Lord.. It's like He's pointing out yet another of the many blessings He has provided.